Lights not working? Planning on building a new office? Can’t get the home network set up? Whatever your electrical issue, look no further than South London Electricians for services in Bromley and the surrounding areas. We are dedicated to providing the best possible service for you, no matter how big or small the job. Our highly trained team have over 20 years experience giving homes and businesses across South London and the Home Counties expert advice and professional services for all types of electrics. Since the establishment of South London Electricians in the 1990’s we have serviced over 3000 homes, and have fixed, wired and installed electronics for a number of supermarket giants such as Tescos, including various smaller businesses and clients overseas. We are members of TrustMark and Checkatrade, two directories that list trusted traders and trading companies that work in line with government standards. Adrian and the team have improved and progressed through the years as a highly successful company, but we are always dedicated to providing a personal, friendly service that ensures your complete satisfaction. By talking to one of our fully trained electricians, we will help you to understand what your problem or query is right from the start of the process, and we will work with you on a one to one basis to ensure that you are fully supported at each step of the process. We offer a huge variety of services, and we offer a free, no obligation quote for your home or business. All of our work is carried out to meet current wiring regulations as well as all health and safety requirements on your premises. We can provide installation of CCTV, security lighting, multi-media integration as well as simple interior and exterior industrial lighting, and electrical testing. For a full list of the services we provide, click on one of the relevant links. Furthermore, in the case of any sudden faults we operate on a 24 hour, 7 days a week emergency callout service. 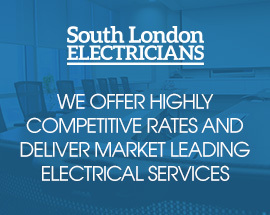 No other company goes further to ensure complete customer satisfaction; with South London Electricians we will continue to support you in all your electrical needs, day or night. If you feel you have a fault or just have a query about the level of expert service that South London Electricians can provide your business in Bromley, talk to one of our electrical consultants on 07956 523316 for expert and jargon free electrical advice, or visit the contact page.